Treecreepers operates in virtually all weathers. 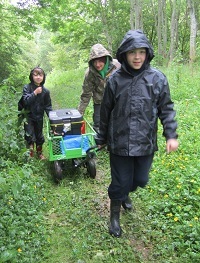 Part of the ethos is that children can experience nature throughout the year and be involved with the changing seasons. We adhere to the principle of “there is no such thing as bad weather only the wrong clothes”. The only exception is if there are high winds. If this is the case the leader will run the session outside of the woodland, if appropriate. On the rare occasion a session needs to be cancelled Treecreepers will let teachers, parents, group leaders know at the earliest opportunity. « What to bring, what NOT to bring?